Any animal can be a wonderful support and companion for us, especially when we are dealing with major life challenges and health concerns. In 1991, I was recovering from breast cancer, including three months each of radiation and chemotherapy. I went into those treatments rather unwillingly, but at that time it made sense. The homeopathic doctor I was seeing urged me to use these allopathic treatments, since he had just watched another patient who had refused them die. Our plan was to “clean up” the collateral damage afterward with homeopathy. I also discovered that the Chinese herbs I was taking were detoxing the chemotherapy drugs so fast that I had to stop using them for a time. It was mostly the lack of a holistic support system and being largely on my own with this scary situation that led me to agreeing to chemotherapy and radiation. Today I know that it is possible that without them I might not have survived, so I am grateful for both the treatments and the experience itself — though I know personally how toxic and debilitating such treatments often are for people. I also believe that if they can be avoided, that would be best. After the last session of chemo had been completed, I was at home — “cured” according to Western medicine. In reality, I knew that the journey to true healing had only begun. I was exhausted, needing a lot of rest, and somewhat discouraged. Then I got a call from Mickey, a woman I had been conversing with on the phone about birds for nearly a year, particularly her parrots. I knew it was time to meet her. The next day I made the 70-mile drive, saw her beautiful breeding parrots and babies, and was invited to stay for dinner. We parted with plans to get together again. Two days later Mickey called and said, “Come get your baby bird!” A tiny week-old baby Catalina macaw had injured herself in the nest box, losing the toes on one foot. Mickey always gave away any handicapped babies. I felt chills when I realized that if I hadn’t listened to my intuition and met her just a few days previous, I might not have been so blessed. Mickey taught me how to make her special baby bird formula, and instructed me in the fine art of feeding and caring for this little helpless creature. I was so excited by all of it; it gave me a new lease on life. Not only did my energy levels seem to increase exponentially, but I felt much better about everything. I called the baby macaw Little Foot because of her toeless foot, which she compensated for so well that she hardly seemed to miss the toes. Later she was able to balance easily on the little foot, and was one of the rare macaws who could rub her own face patch without scratching it. A week-old baby macaw is naked, with closed eyes, and can fit into the palm of your hand. I was the first thing Little Foot saw when she opened her eyes. I fed her baby formula with a spoon every four hours around the clock. It wasn’t easy getting up during the night for these feedings, but I persevered. It was magical to watch her grow and develop little pin feathers. My life had new meaning and hope now that this little baby bird looked to me for everything. I happily took on the role of mother for her, forming a very close bond. I hand fed Little Foot for six months until she was completely weaned onto adult food and fully feathered. She became a gorgeous orange-breasted macaw, about two and a half feet long to the tip of her tail, with a wingspan about as wide. She followed me everywhere, as hand-fed babies will, and was so smart I soon taught her to use only her T-stand to “potty” away from the cage, and to speak English words and phrases. As soon as she took her first flight, she was in command of the household, overseeing Scooter, a black tabby cat, and Kiko, a malamute. Scooter the cat especially respected her beak and stayed clear of her. We were a happy, congenial family. Little Foot was a cherished companion for nearly 11 years, accompanying me on the move to Alaska to work closely with a medicine chief, teacher and friend. She weathered the ups and downs of my Healing Adventures with grace and a spunky personality. Her funny dance moves and perpetual smile helped me remember the humor in life in whatever situation presented itself. She travelled with me from Chicago to Alaska, to Oregon, and back to Alaska, always there as a dear friend and companion. In 2002 Little Foot passed away from liver disease, yet returned to me in a new macaw body only three months later – a testament to the strength of our bond, and the power of passionate prayer…. a story for another time. I will never forget the new purpose a little baby bird gave my life in those early days of my own recovery and healing. She was a daily reminder of the beauty and magic in life, a true healer for the soul. 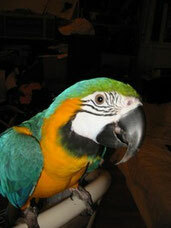 Note: Little Foot returned to me in October of 2002, as a baby blue-and-gold macaw. I raised her from six weeks of age, and she is now almost 13 years old in her second incarnation with me. What a blessing!